This post may contain compensated links. Find out more info in our disclaimer. Dealing with the cold Canadian winters can be tough. The short days and slushy weather can get us down. Sure we had found great ways to beat the winter blues in the snowy north, but by March, we were craving sunshine and soft sand. The beautiful Atlantic island of Bermuda seemed like a great option to escape the cold. We decided to treat ourselves to a 4 day trip to Bermuda. And we made it our mission to search for the best Bermuda beach. That would turn out to be a tougher challenge than we expected! Bermuda is composed of over 100 islands with a total surface area of just 20 sq miles (33 km²). 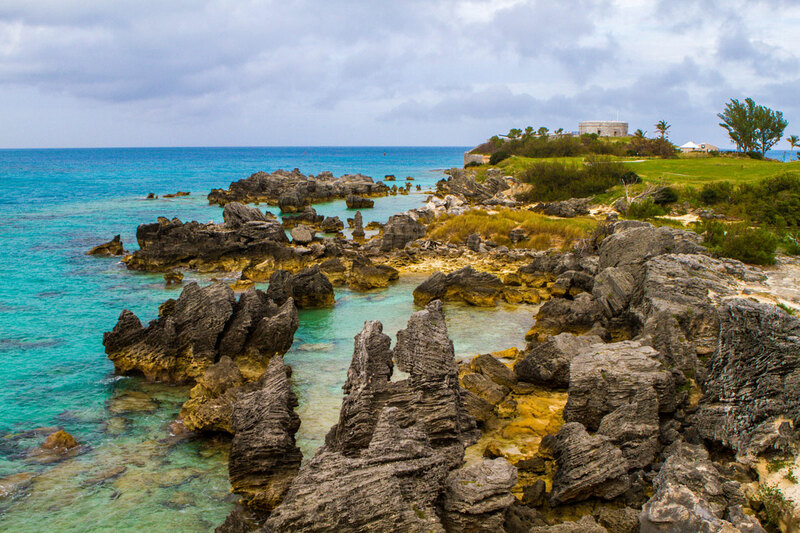 While Bermuda seems small, it’s actually made up of 6 primary islands. Most of these are connected to each other by bridges. Bermuda is divided into 9 parishes or districts and there is a total of 34 official Bermuda beaches on the islands. If you’re preparing for a trip, you can check out our favorite family travel gear here. Contrary to popular belief, Bermuda is actually not a Caribbean island. In fact, Bermuda is located about as far north as North Carolina. For those looking for a winter island vacation, a visit to Bermuda can offer a bit of a surprise. While the island offers comfortable weather year-round, Bermuda weather in the winter can be a bit chilly. And the best beaches in Bermuda can get cool. This is especially true for those who are used to warmer temperatures. 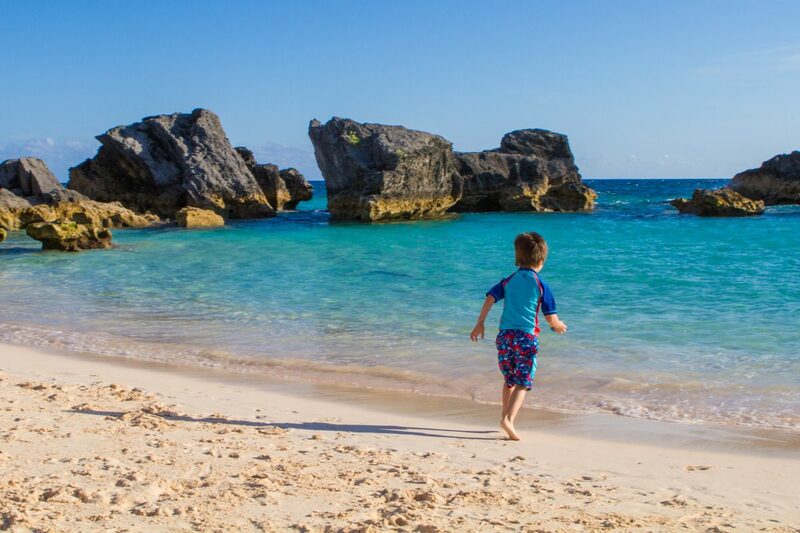 The best time to visit Bermuda depends a lot on what your family travel goals are. Our family was looking for comfortable temperatures, and water warm enough for a refreshing dip. But we wanted to book in the shoulder season when Bermuda travel prices aren’t at their highest. That way we could take advantage of boating the island and exploring caves in Bermuda without the crowds. For those goals, March and April are the best time to visit Bermuda. But for those looking for warmer waters and those not afraid of higher costs and busier beaches, June through September are peak season for the island. 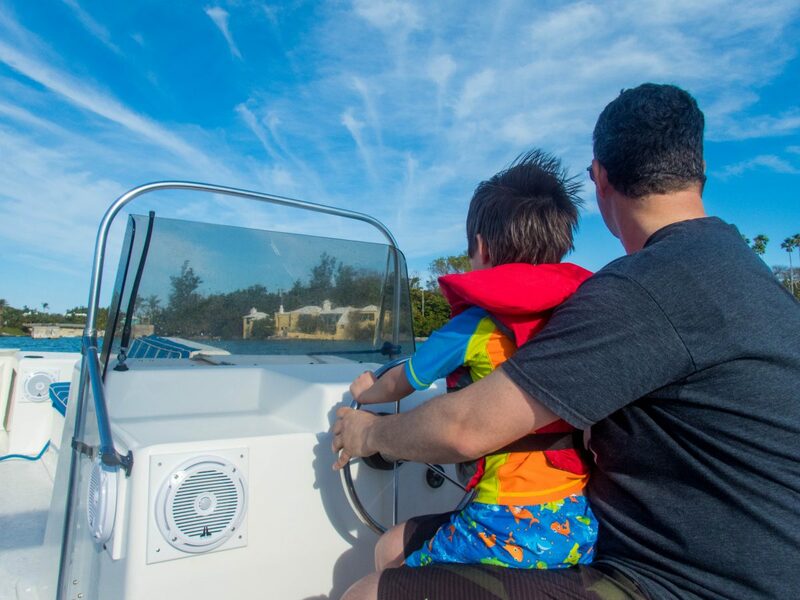 For those visiting Bermuda with kids, everything revolves around the water. So timing your visit is important! One of the things that makes Bermuda one of the popular beach destinations in the world are the incredible pink sand beaches. The Bermuda pink sand beach color comes from tiny red organisms that grow under coral reefs. As they die, they wash onto the shore and mix with the sand. With time, the sun exposure bleaches their red color making it appear pink. 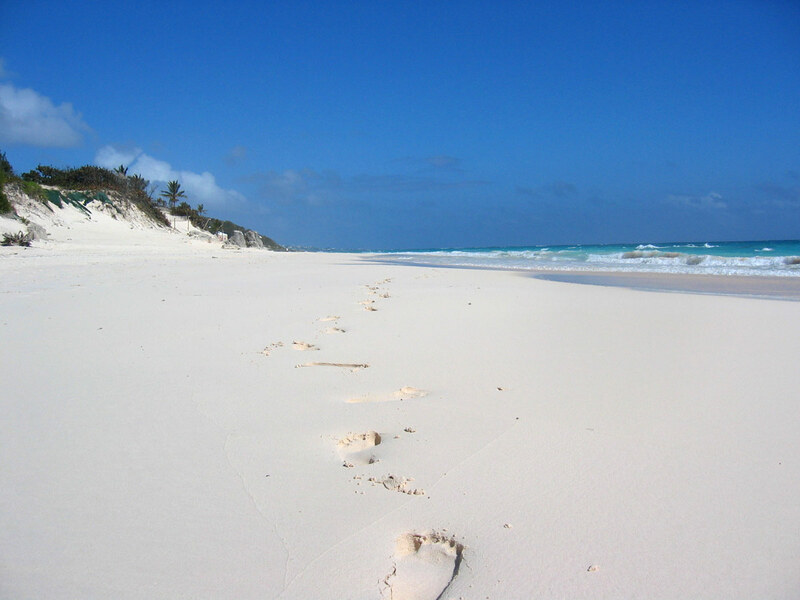 What is the Best Bermuda Beach? Elbow Beach Bermuda is one of the most popular beaches in Bermuda for locals. It shares its name with the Elbow Beach Hotel, so often visitors to Bermuda miss Elbow Beach as an option, thinking it is a private beach. But much of Elbow Beach is open to the public making it one of the best beaches in Bermuda. Where is Elbow Beach in Bermuda? 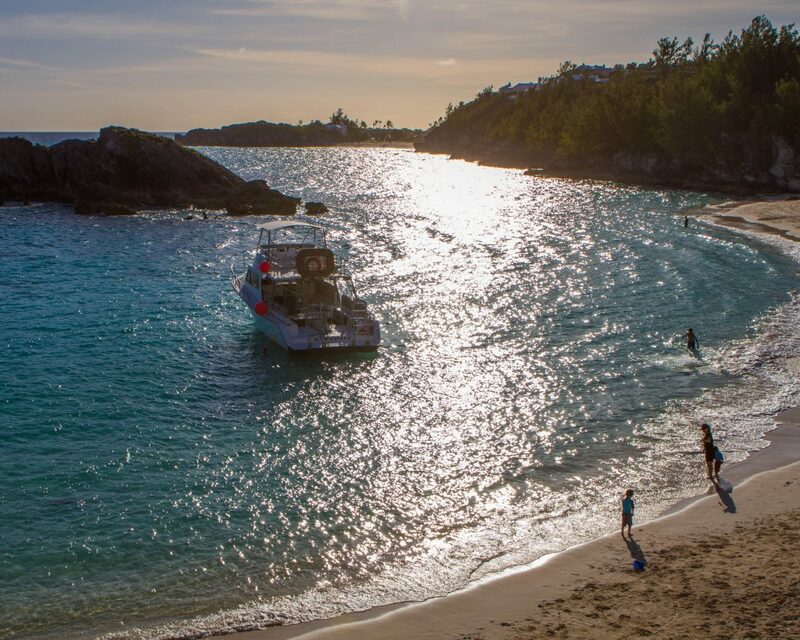 As with many of the best Bermuda pink sand beaches, Bermuda Elbow Beach is located on the south shore of the island just a few minutes outside of Hamilton. Located in Paget Parish, Elbow Beach is also the home of Elbow Beach Resort. Similar to East Whale Bay Beach, part of Elbow beach is privately owned by the Elbow Beach Hotel. Although the rest of the beach has public access. Elbow Beach is one of the most popular beaches in Bermuda for locals. It’s a hot spot for post-work strolls and beach volleyball. About 300 ft from shore is the Pollockshields shipwreck which is great for snorkeling. Kids in Bermuda can get a great look at marine life in the shallow breakers just off of the shore. Horseshoe Bay Beach is arguably the most famous beach in Bermuda. The most famous of the Bermuda pink sand beaches central position in the country makes it a destinations for both locals and travelers to Bermuda. It’s also a hub of social activity on holidays and special occasions. Horseshoe Bay Bermuda located in Southampton Parish. It is attached to East Whale Bay on the right. And it sits just below the Fairmont Southampton hotel. There is a hiking path connecting many of the beaches on this side of the island. Horseshoe Bay Bermuda received its name from its long, curving form. 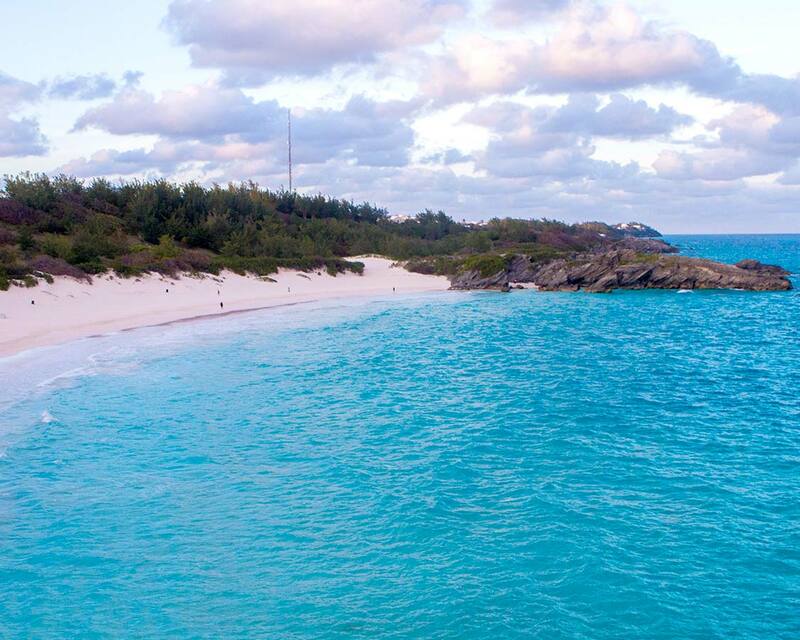 It has the worldwide reputation of being the best Bermuda beach due to its very pink sand and soft texture. When we first arrived at Horseshoe Bay Beach Bermuda, I was skeptical. There was no way that the perfect Instagram photos showing the Bermuda pink sands were, in fact, real. I was wrong! Pro-Tip: To Get the best photos and views of the Bermuda pink sand beaches, arrive just before sunset. The sky accentuates the colors of the sand. The shallow turquoise waters of Horseshoe Bay Beach are honestly one of the most family-friendly beaches we’ve ever experienced in our world travels. It’s often easy to see marine life such as parrot fish and angel fish swimming near the rocky outcrops on either end of Horseshoe Bay. There is a large parking lot for visitors and during the high season there is a restaurant on site. There are also free changing rooms located in a blue building near the entrance. The Horseshoe Bay Beach facilities include snorkeling gear, chairs, umbrellas and other beach gear for rent. And while you can snorkel at Horseshoe Bay Beach, it’s really best for lounging and swimming as the currents can be tough for inexperienced swimmers. 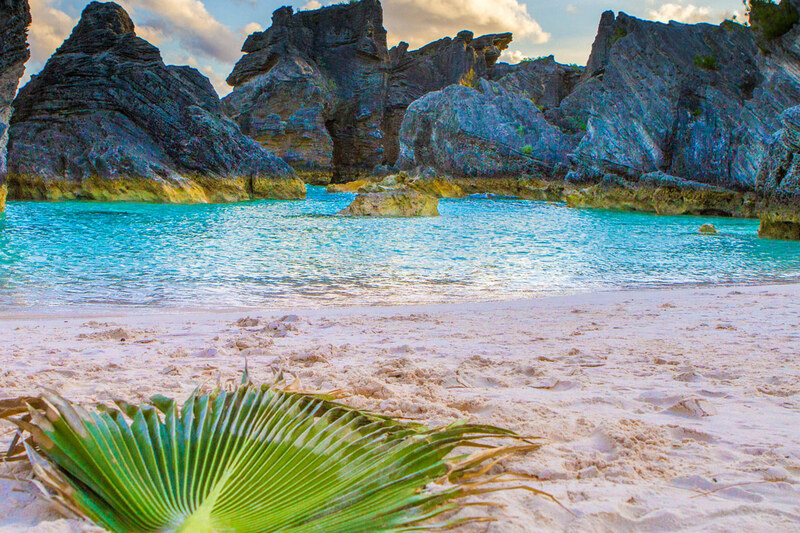 Visitors to Bermuda can also join the locals at popular festivals held at Horseshoe Bay Beach including the Sand Sculpture contest in September and the Bermuda kite festival on Good Friday during Easter weekend. Pro-Tip: The kite-making event at the Fairmont Southampton is open to anyone on the island. There is a small fee for those not staying in the hotel. Port Royal Cove, also known as Baby Beach, sits on the right hand side of Horseshoe Bay Beach. It is absolutely incredible for families in Bermuda. If you walk to the western end of the beach (towards the right side if you are facing the water) you can’t miss it. The rocks surrounding Port Royal Cove prevent the waves from being very strong and the water is shallow, making it perfect for families with small children. Both the boys had a blast splashing around, swimming, and trying to spot colorful Parrot fish. For the second night in a row, we watched the beautiful sunset towards the mesmerizing azure waters of Bermuda. Horseshoe Bay Beach is situated near the midway point of the island. And the closest hotel to that is the famous Fairmont Southampton. This is where we opted to stay during our time in Bermuda As soon as we were checked in at the Fairmont Southampton, we were ready to hit the water. The Fairmont Southampton hotel offers a free shuttle to Horseshoe Bay Beach which was waiting by the front driveway. The bus took us on the 5-minute drive downhill to the hotel’s private beach in East Whale Bay, right next to Horseshoe Beach Bermuda. East Whale Bay Beach Bay was named for the whales which can often be seen from the shore during the spring season (March and April). The whales, mostly humpbacks, migrate to their northern feeding grounds during this time of year. The kids were so excited that as soon as they got out of the shuttle they ran straight to the water. Located in Southampton Parish, East Whale Bay Beach is a private beach owned by the Fairmont Southampton Hotel. Stunning rock cliffs separate it from the public, and much busier, Horseshoe Bay Beach. Unfortunately, luck was not with us, as we didn’t see any whales while we were at the beach. We did meet several people at the hotel who had managed to catch a glimpse of them though. East Whale Bay Beach is also a popular spot as a Bermuda snorkeling destination. The bay has sheltered waters and a coral reef that is accessible by strong swimmers. The reef is located just past the large rock in the middle of the bay. East Whale Bay Beach has a number of amenities thanks to the luxury offerings of the Fairmont. There is a beach restaurant, store, and facilities for renting snorkeling gear. The beach also has chairs and beach umbrellas available for free for hotel guests. 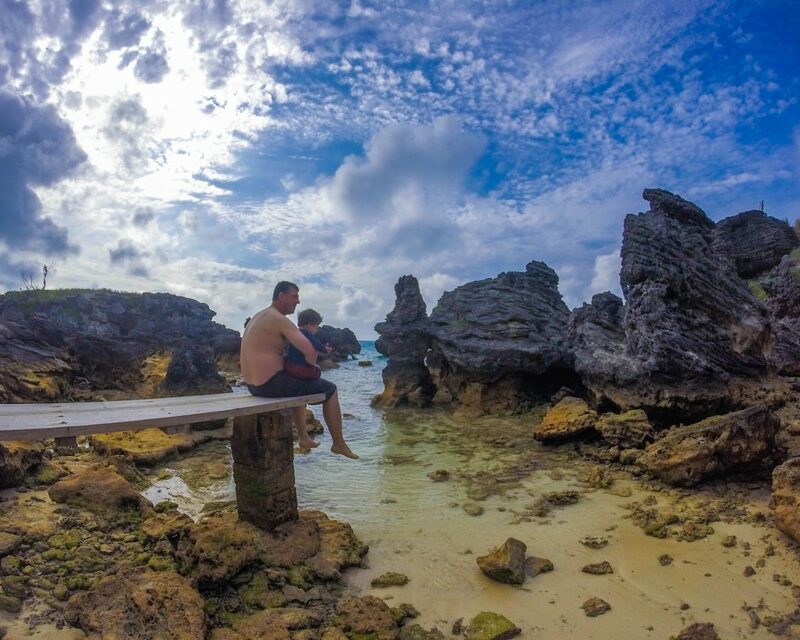 Cooper’s Island Nature Reserve is an often overlooked gem near the Bermuda airport. This former military base has been transformed into a nature reserve and offers some of the best nature experiences in Bermuda. 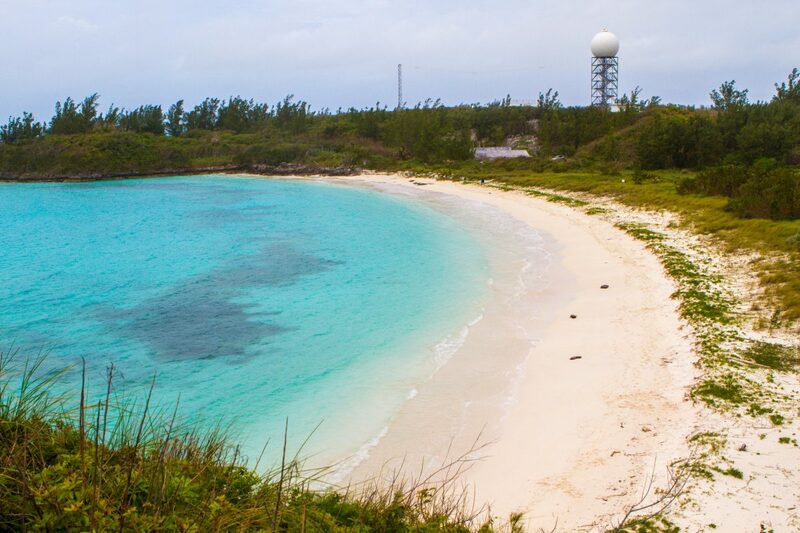 Cooper’s Island is also one to some some of the best Bermuda beaches like Long Bay Beach and Clearwater Beach Park. We discovered Clearwater Beach Park when we hired a taxi guide via the hotel concierge to give us an island tour. As a native of Bermuda, our guide, Mr. Andrew Trott, provided us with a lot of insight into the island’s history and how it has changed throughout the years. A highlight of our tour was when we stopped at Cooper’s Island Nature Reserve, a Bermuda National Park, for a picnic lunch. Clearwater Beach Park is located in Cooper’s Island Nature Reserve in the south eastern end of St. Davids Parish. the island was largely inhabited by the US military until 1995 when the US military left the island. Since then Bermuda has been transforming much of Cooper’s Island into a beautiful 45 acre nature reserve. Being in the running for the best Bermuda beach may not be enough for some sun lovers. Well part of what makes Long Bay Beach so great is just how much there is to do nearby. Cooper’s Island Nature reserve offers stunning hikes and nature viewing. Pro-Tip: Full sized cars are not available for rent by tourists on the island. The majority of tourists get around the island by renting scooters. They are an economical and efficient way of getting around. Although, caution must be observed as the roads on the island are narrow and winding, with many blind corners. Recently small electric cars have become available for those staying in select hotels. There are no hotels or accommodations within Cooper’s Island Nature Reserve. Most visitors to the area usually come by day trip. 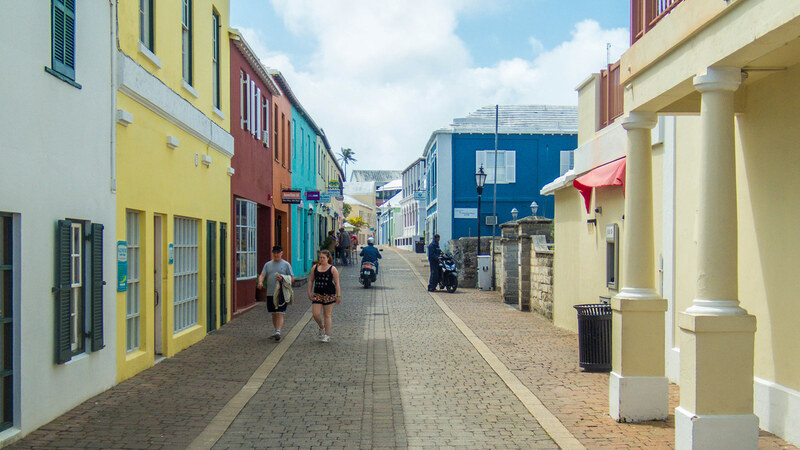 The closest major town with accommodations is Bermuda’s former capital St. George. St. George Bermuda is a great place for families to stay in Bermuda. The best ranked hotel in St. George Bermuda is the Grotto Bay Beach Resort. 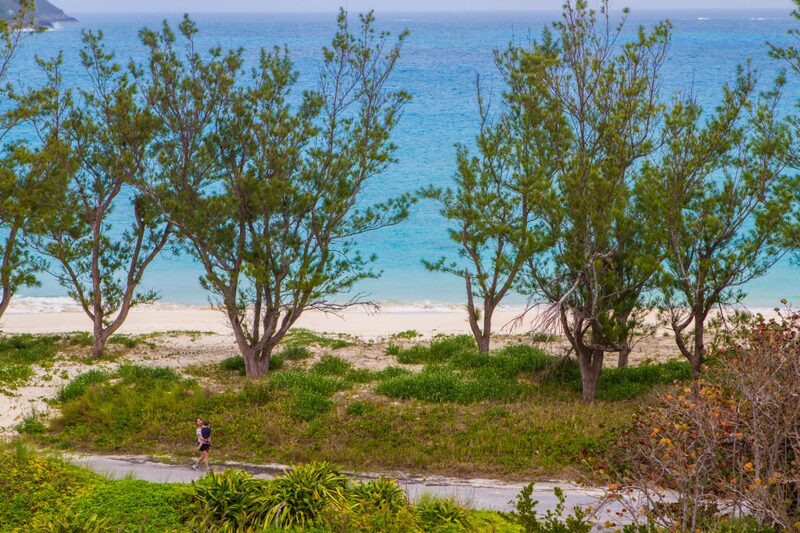 Easily in the running for the best Bermuda beach is popular Tobacco Bay Beach. 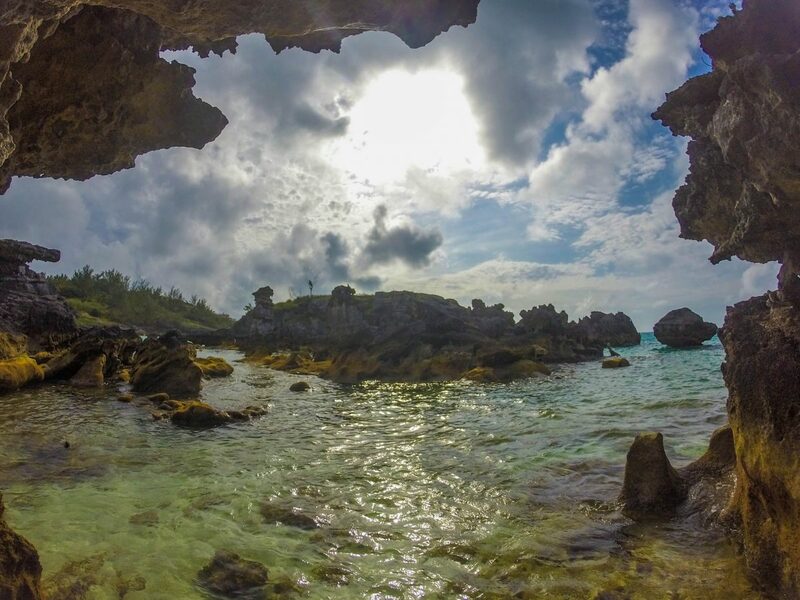 While not one of Bermuda’s pink sand beaches, the shallow waters and beautiful scenery more than make up for it. After lunch, we headed to the historical town of St. George’s. Mr. Trott drove us around town so we can get an overview of the area. we explored the old town of St. George on foot. After a couple of hours leisurely strolling the island’s former capital, we were ready for another beach! Wandering up through the town, past the famous unfinished church, we headed to Tobacco Bay. Tobacco Bay Beach is located about a 15-20 minute stroll or a 5-minute drive north of St. George. For those coming from the dockyards, you can take a minibus for about $7. The route to Tobacco Bay takes about 7-minutes. Pro-Tip: Tobacco Bay Beach is quite small and can get overwhelmed with tourists when cruise ships arrive. Try to time your visit around the Bermuda cruise ship arrivals. Tobacco Bay Beach is managed by the private company Beach Boys. There are bathrooms, changing facilities and a restaurant and bar. Showers are also available here. Visitors to Tobacco Bay Beach can also rent chairs, paddleboards, kayaks and snorkel gear. The shallow clear water and rocky walls of Tobacco Bay Beach make it perfect for snorkeling. In fact, for the more adventurous, you can snorkel between Tobacco Bay and Achilles Bay (towards Fort St. Catherine). During the summer there is a beach bonfire and live music on Friday’s during the summer and live entertainment daily. Most people visit Tobacco Bay Beach from nearby St. George. There are some great accommodations in St. George Bermuda that are worth checking out. And during the summers make sure to check out the daily dunking of the wench. 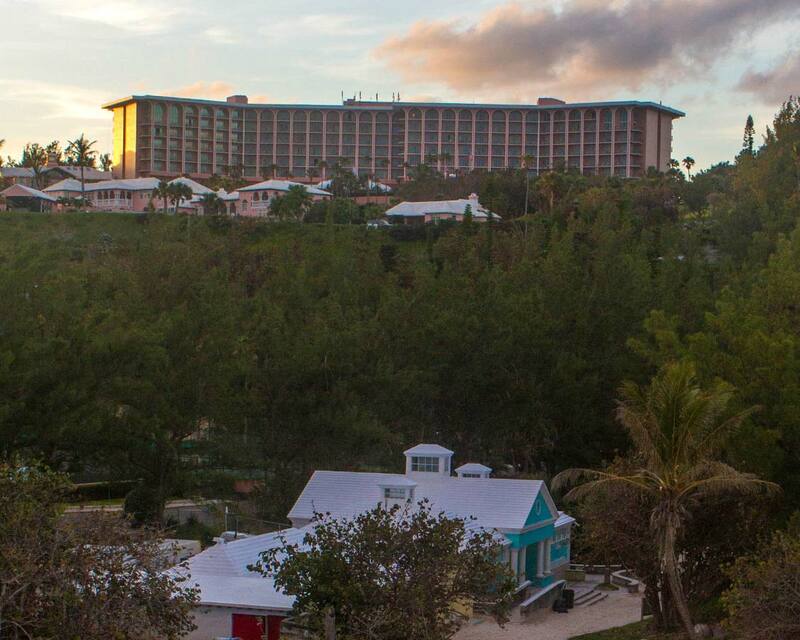 The most highly ranked hotel in Tobacco Bay Beach is the Grotto Bay Beach Resort. Searching for sea glass has become a popular tradition for those who travel to Bermuda. 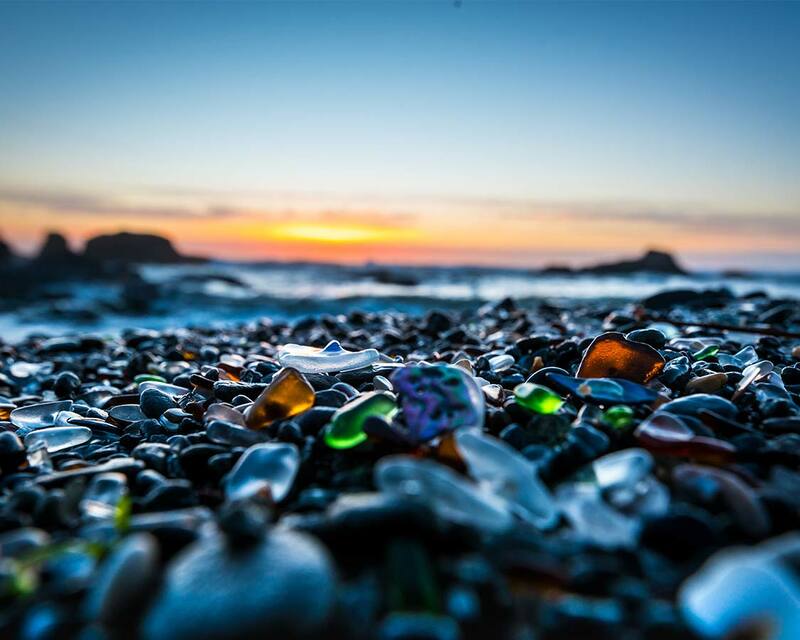 Sea glass is the remains of glass bottles and containers that has been worn down by the surf into smooth, colorful stone-like treasures. Where is Sea Glass Beach Bermuda? While sea glass can be found at many beaches in Bermuda, the best beach for finding sea glass is Sea Glass and Black Bay Beach. Sea Glass beach is located about 20 minutes from Kings Wharf and the Royal Navy Dockyard on the west end of Bermuda. Since 2004 much of the collection of sea glass in Bermuda has been regulated or outright banned. WEDCO (West End Development Corporation) has posted bills noting that the collection of sea glass is against the law in Bermuda. This rule was put in place due to the large number of visitors collecting sea glass, and they were worried that the popular attraction would completely disappear. You can still buy sea glass artwork at many of the stores throughout Bermuda. They make popular jewellery and keepsakes for those visiting Bermuda. On our second last day in Bermuda, we awoke bright and early, ready for our next adventure. We had rented a boat in the Royal Navy Dockyards. Our plan was to head out and headed out in search of our own piece of paradise. Many beaches in Bermuda are privately owned. This meant that as we were touring the coast, searching for the best Bermuda beach, we were often met with no trespassing signs. It seems that apart from many of the most popular beaches in Bermuda, most seem to be owned by resorts, golf courses, or private citizens with enough money to own the land. Although we didn’t hit every beach in Bermuda, the Bermuda beaches we did have a chance to explore didn’t disappoint. We set out on a mission to find the best Bermuda beach and we failed. All the beaches in Bermuda were amazing in their own unique way! There is truly a beach for everyone here. Located near the Royal Navy Dockyard, Somerset Long Bay Beach is one of the most pristine beaches in Bermuda. It has all the pink sand of Horseshoe Bay Beach but without the crowds. Church Bay is a popular snorkeling beach in Bermuda. There is a great reef just a short distance from shore. Admiralty House Park is a popular spot for those looking for a little adventure. The cliffs here are popular jumping spots. Warwick Long Bay Beach is one of the most photographed beaches in Bermuda. The craggy rocks and small sea caves. It is one of Bermuda’s most famous pink sand beaches, yet it doesn’t see nearly the crowds that the more popular beaches get. From Warwick Long Bay Beach you can easily walk along the waterfront to nearby Jobsons Cove and Stonehole Bay. Disclaimer: We were guests of Fronterra Camp during our visit in Prince Edward County. Our views remain our own. Wandering Wagars is a participant in the Amazon Services LLC Associates Program, an affiliate advertising program designed to provide a means for sites to earn advertising fees by advertising and linking to amazon.com, amazon.co.uk, amazon.ca. Amazon and the Amazon logo are trademarks of Amazon.com, Inc. or its affiliates. It’s quite incredible that Bermuda is only a two hour flight away from Toronto, but you are very fortunate to have this little slice of paradise quite so accessible to you. You certainly seemed to have squeezed in a lot during your time there and I must say that one shot, the one in which looks out over the coast and appears to have been taken from within a little rocky alcove is particularly lovely. Glad you had such a great time. Thanks! Yes, there is a great rocky rise between the cove and Horseshoe bay where a lot of locals do their fishing. A very cool place to visit. I have been to Bermuda and really enjoyed the beaches. Totally relate to the need to get away from the hard winters here in the north. Loved the article and especially the photos. I think the thing that caught my eye was the incredible blue water… even when the sky was covered in grey cloud! I just love those rocky beaches with their surreal shapes. No wonder in Spain, they inspired Dali so much. Wow, Bermuda looks so beautiful! Irish winters are not as harsh as Canadian ones but I do understand the need for a beach break: I never realised Bermuda was only two hours from Toronto – we have a lot of amazing European destinations nearby, but nothing as summery as this! You are so lucky that Bermuda is just a 2-hour flight from Toronto. I live an hour north of Winnipeg, so factor in the hour’s drive, and then a 2.5 hour flight to TO and we will finally get there. But it does indeed look wonderful and worthwhile. I hope to get to Bermuda one day soon, but in the meantime, I will dream about it as I taste this delicious Bermuda rum. Happy National Rum Day! Great post of all the beaches! They all look so lovely!! I didn’t realize Bermuda was only 2 hours by plane from Toronto! Did you try the Dining Room Restaurant at the Gibbs Lighthouse? Such good food and really close to Horseshoe Beach. Not sure we had a favorite beach…each brought their own characteristics. The weather has changed today and it is suddenly cold. But reading your post just warmed me up. I could nearly feel the warmth of the sun and the sand between my toes! Those are really beautiful beaches! I can imagine that your kids were very excited! And waw the rock formations of Tobacco Beach are incredible!! That view is spectacular. I love the clear water, the white sand, and the sunsets. Always my favorite time of vacation is beach time. I’m usually so happy that I live in Europe – everything is close and it doesn’t cost all that much to fly around. But reading something like this makes me jealous of everyone living in the US and Canada. You’ve got all these different unique and tropical destinations that just look gorgeous.. Wonderful! Looks like a great family friendly place! I will have to take my little girl. I love that you are traveling with your kids! Happy travels mama! Thanks! Definitely go with your little girl when you can Erica. The sand is so soft the kids loved it. And happy travels to you too. Your pictures and truly spectacular and enough to entice anyone there!! I’m gutted I live so far away but am definitely adding this to my bucket list! Holy cow! Those pics are amazing! Glad you and your family had such a great time! You are so lucky to reach Bermuda on a such short flight! I think I would not want to go home if I visited. Shew, all of these beaches look pretty awesome to me. Though based on your pictures, I’d go with East Whale Bay. Really awesome looking places you went to, guys. Thanks for sharing this, Christina! I don’t think I could choose – all those beaches look beautiful. I’ll check back on this post if ever I make it to Bermuda. Fingers crossed! All the beaches in Bermuda look great! I liked Whale Beach because it seemed like no one was there. I think the kite festival is great for families. How long did it take to make the kite? I’ve not been to Bermuda, but you’ve given me an idea of where to travel with my three, now grown, beach loving kids. Your photos are gorgeous. It is so nice that Bermuda is only a 2-hour flight! I agree with your conclusion, all the beaches look sand sound amazing. I’d love to visit one day. Such beautiful beaches, very difficult to choose one over the other. Probably the best thing is to spend a couple of days at all of them. For me Bermuda holds a special fascination not because of the beaches but because of the Bermuda triangle. I don’t know if you really need to search for the best beach in Bermuda. It looks like any beach would do to me LOL. Great pictures as usual! We have not been to Bermuda, and from looking at your photos it sounds like a trip there is long overdue! What a quest. I love it. That’s not a bad way to take a break from work! We didn’t get a chance to see Elbow beach, but it gives us something to look for next time! So lucky to be close to such a paradise! Always wanted to go to Bermuda but it’s too far and probably expensive. We’d have to go through US probably. For now, your beautiful pictures will have to do. Wow. I think you struck gold with each and every beach in Bermuda. 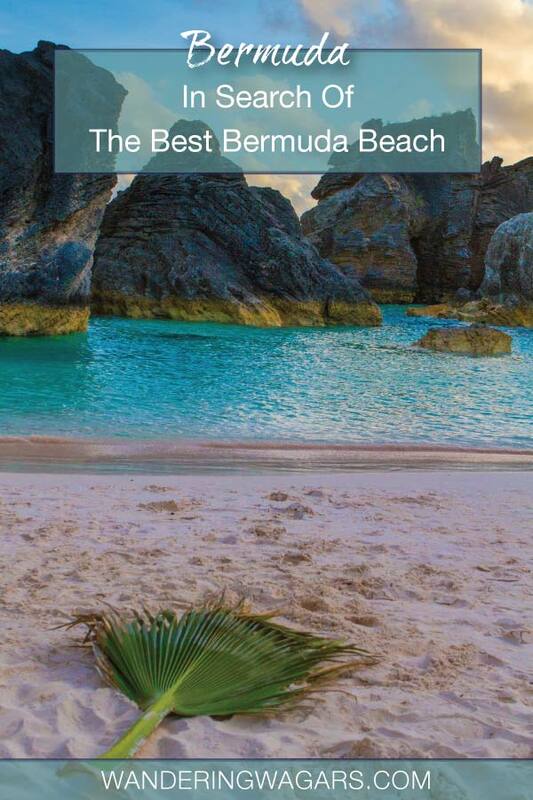 And I like that each beach offers something different… Bermuda is now on my bucket list! This is definitely my kind of place! The beaches look amazing. Friends have told me that Bermuda is expensive, I wonder if you found that to be true? Thanks for this comprehensive guide! I don’t think I could have chosen-they all look great! I think I’d be happy with any of them but Tobacco Bay would be my pick if I was pushed for a favourite. Stunning location and beautiful photos. Once again, an incredible experience for the kids. 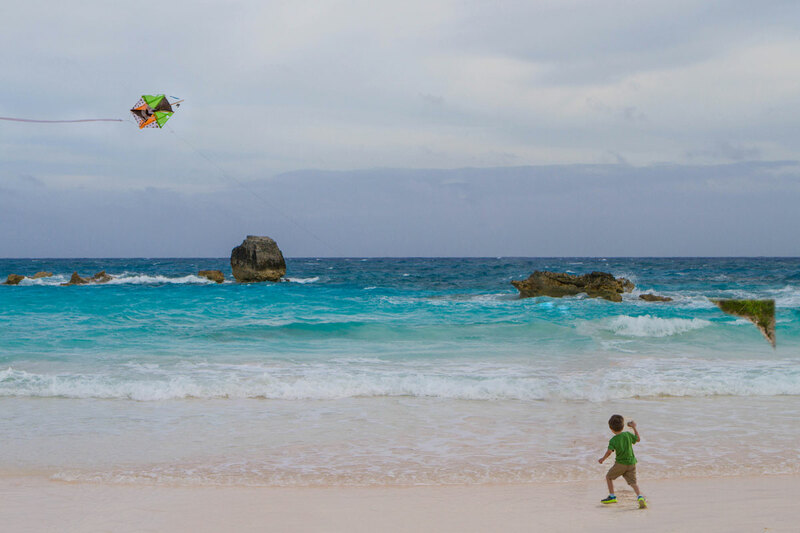 I can’t help myself but admire these beautiful Bermuda beaches, and yes the kite festival! Summer is indeed the best season. Thanks for a comprehensive review. It might be helpful to make wise travel decision. Beautiful photos, Christina! Now I am dying to go on a beach vacation!! Awesome pictures! All the beaches look ridiculously cool and equally stunning. But I’m gonna go out on a limb here and say the that the Port Royal Cove is the best beach 🙂 I’m partial to beaches with rocky outcrops and amazing sunsets. They all look beautiful to me ? That many beaches in such a short period of time, I’m so jealous…. And yes, by Easter I can see myself being sick and tired of the slush and snow aswell. I didn’t realize it was such a short flight from Toronto. I love the variety of experiences you were able to have, even if reaching some beaches was traumatising haha! Do you know why Horeshoe bay has those magical pink sands? It really is gorgeous there. The pink sand comes from micro-organisms that live within the coral. As they die they wash up on the beach giving it the pink colour. These are marvellous photographs Christina! I have never been to Bermuda but I like the sound of Cooper’s Island Nature Reserve, because it’s entwined with the Bermuda National Park. Sadly, I’m one of those weird people that doesn’t like beaches, unless there’s lots of things to do. Off the beach! This reserve sounds like such a place lol! Loved the explanations for the pink sands! Great article! Bummer that you guys did not see any whales. The rest of the vacation looked amazing. Beautiful beaches and great family fun! Any idea why foreigners are not allowed to rent a car? Weird! With the island’s small size and narrow, winding roads. I believe they felt it was a hazard to allow tourists to rent cars. Scooters are still available for rent however. 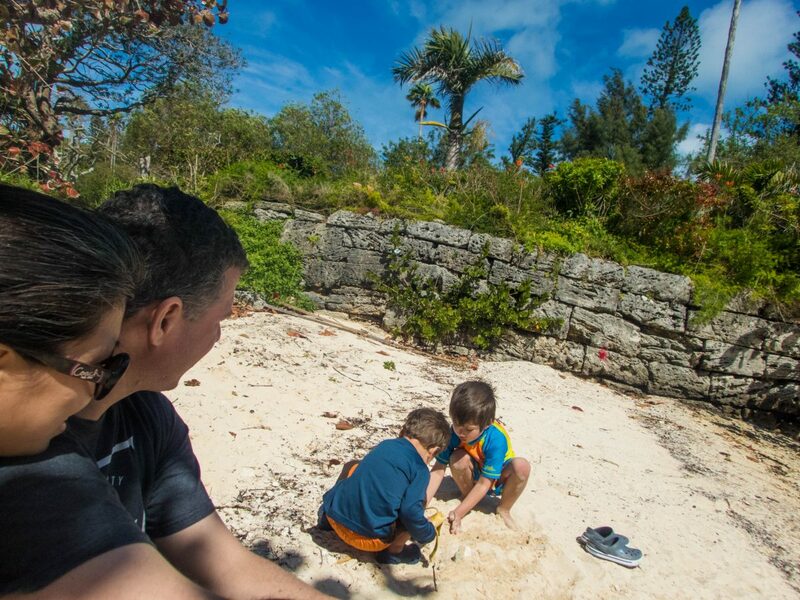 Bermuda has awesome beaches and your family is lucky to explore many of those. Looking at the photos my favorite would ne the Long Bay Beach. I love something like that to stay and unwind. I’ve not been to Bermuda, but everyone I know that has raves about it. How could you not fall in love with that water? These beaches look absolutely UNREAL! I would love to see a pink sand beach in person. I have never been to Bermuda, but it’s definitely a place I can see myself 😉 I also love how you really went out there and explored to find all sorts of beaches. Sometimes you need a taste of everything! Wow! I really want to see whales sometime. The kites look very fascinating and must be a great experience to fly kites on the beach. Such lovely clicks, especially the horseshoe bay. It looks stunning! Didn’t know Canada and Bermuda had the kite culture! Wow that’s some beautiful beaches! 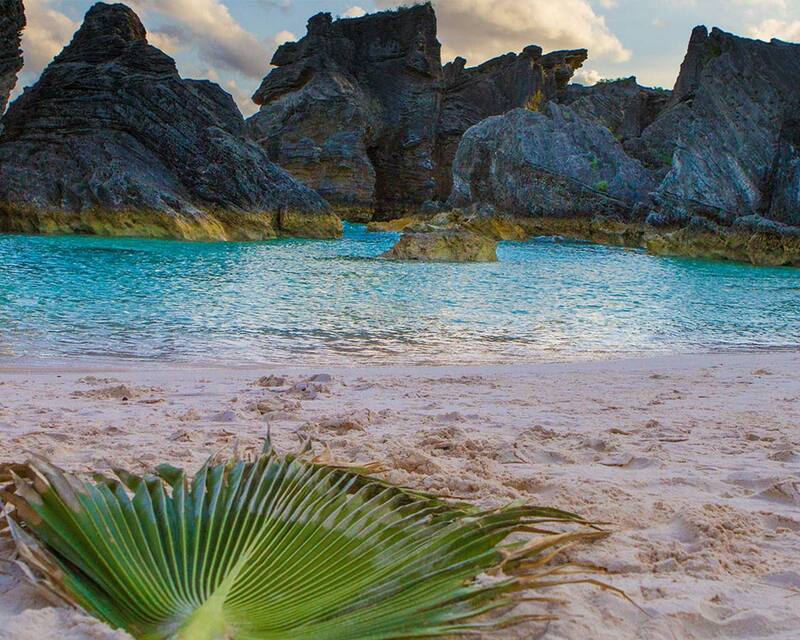 Bermuda looks like such a paradise, I’d love to visit some day! Horseshoe beaches seems to be my favourites. I was following some friends’ travel to Bermuda on snapchat recently and now also reading your post I am even more convinced that I would love to fly there! It is a dream of mine to spend some (or all) of dreary, cold January or February in a warm place. It’s pretty inexpensive to fly to Bermuda from the American east coast and midwest. However, due to some of the limitations and popularity, I haven’t gone yet. The beaches really are beautiful and I believe we will have to take a trip there sometime! What a great holiday! Great break down! I’d love to visit. Ahh! I want to go to Bermuda so much, especially since it’s such a short flight from Boston. My answer to your question of which is the best beach is, “They all look AMAZING.” I will get there soooon! I have always read mysterious stuffs about Bermuda. This is the first time I am reading a personal experience there! And I so want to experience it! These are the kind of posts that inspire travel! Well done! I’m glad you couldn’t choose the best, either! I was thinking the same as I read your post. Pink sand sounds like an amazing beach sight. I always like to spot wildlife on travels so doing some whale watching would be right up my alley. Come summers and beaches are the best places to go. It seems you guys enjoyed a lot especially the little ones. The beaches in Bermuda are amazing! I have never been but I’d love to go. And how great that you were there for the Kite Festival! I think it looks like your son had a wonderful time in the photo. We haven’t been to Bermuda but it’s definitely on our list. It’s so close to NYC at only 2 or 3 hour flight, it’s an easy place to visit. I’m glad to hear that the beach actually does have pink sand. All the beaches look beautiful, will really have to visit soon. You are so lucky to be so close to the Caribbean and fly there in only 2 hours. Last winter I took a flight from Toronto to Havana and it was only 3 hours long. The beaches of Bermuda looks absolutely stunning. I love the color of the water and how clear it is. Swimming there must have been such a bliss! I wish we were. Contrary to popular belief, Bermuda is actually quite far north from the Caribbean. I sit’s in the North Atlantic, about as far north as South Carolina in the United States. To this day, Bermuda is one of my all-time favorite vacations! I went with my extended family about 10 years ago, and I have fantastic memories, so it was very nice to relive the experience through your stories and photos. As for my favorite beach, we just stuck with j. If I go back, I will have to check out Long Bay! You can’t go wrong with Horseshoe bay! It’s quintessential Bermuda! This sounds like a pretty amazing mission! 🙂 All of the beaches look gorgeous, and I think East Whale Bay Beach and Horseshoe Bay Beach would be my favorite. I would love to check out the pink sand! I can see why you couldn’t choose, they all look stunning. Would love to attend the Kite festival, so colourful and bright. Sounds like a great beach-hopping opportunity. And your conclusion bares it all…all of them are great! With a kite-flying festival to boot! I had no idea Bermuda was so close to Toronto. 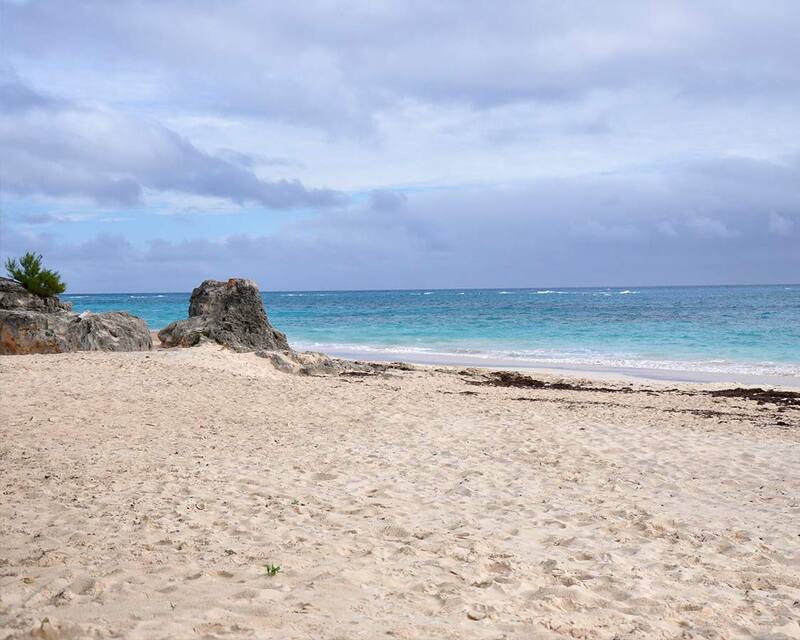 Finding the best beach in Bermuda – not a bad mission, eh?! Loved the photos. All the spots you checked out look gorgeous! Anyway back to your story, all the beaches that you went to looked equally amazing indeed, but if I have to pick, I would love to go visit the East Whale Bay Beach just because there’s a chance to see whales. Too bad you didn’t see them though. It would have been quite an experience. Wow, really great breakdown of Bermuda, I place I haven’t yet been but plan to in the near term. I’m not surprised you failed on this mission haha, they all seem beautiful. I think what I like most is that none of the beaches you feature seem to be too overcrowded. I’m not surprised you failed since I have no idea how I could choose either. I think if I could only pick one to visit it would be Horseshoe Bay but really I’d like to visit them all. Hoping for another Caribean trip this fall so maybe it will have to be Bermuda. Wait, 2 hours from Toronto to the Bahamas?? One of the reasons I never went there was because I thought it was too far away.. and I am from Louisiana! The photos are incredible. What wonderful beaches they have in Bermuda! I had no idea. Love the pink sand beach, and Tobacco Bay, very interesting for the little ones. A two hour flight to Bermuda is not bad at all. Bermuda reminds me of the Cayman Islands. What do I think about bermuda beach? Its heaven. Wow ever place of the island are beaches. Again it’s awesome. I really would love to explore places like this. I’m in love with beach and this should be included in my list. The view is astonishing. The sand looks pure too. So many beaches! Now that we are back on the East Coast, we really need to go explore Bermuda. I had no idea Bermuda was only a 2hr flight from Toronto – how lucky! Your photos are stunning. It looks like the perfect escape from cold weather. The kite festival sounds like so much fun! So random that you found your own little secret spot too! Thank you for sharing your adventures, some serious wanderlust kicking in. I have yet been to Bermuda, but this is such a great Summery. I am not much of a Beach person, but I think I might step into these Footprints because of the Difference of the Beaches, and I love the Rock Formations of Tobacco Beach. Beautiful Photography. Took a cruise out of New Jersey to Bermuda last May, most beautiful place i have been. 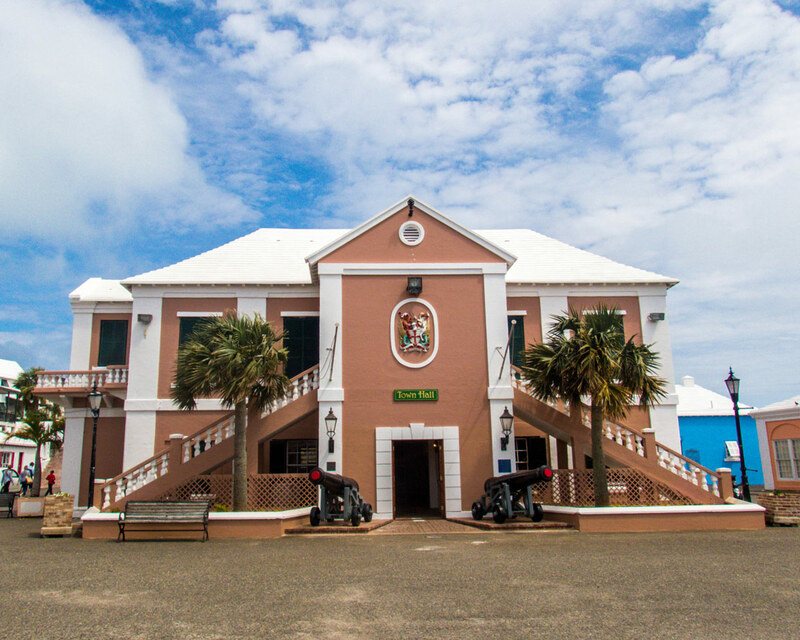 We rented a moped and drove the whole Island from The Royal Naval Shipyard to St George. Stopped for a couple of rum swizzels on the route. Make sure to stop in Hamilton on the way. Horseshoe beach and Tobacco beach are stunning. Cant wait to go back, the views from the road as we traveled via moped were breathtaking. Oh and dont forget to drive on the LEFT side of the road as i almost met my maker a couple of times!!?? Awesome article! I’ve always wanted to see the pink sand beaches of Bermuda. Was the snorkeling good on the island? I’m always looking for new snorkeling and diving spots! Your photos are incredible. We are heading to Bermuda in February to escape an Ottawa winter, while we know it won’t be extremely hot in Bermuda we are hoping to also enjoy some beach time with our 2 year old daughter. We are also staying at the Fairmont Southhampton and would love any tips or advice! The Fairmont Southhampton is a great location. Nice and central and minutes from Horseshoe Bay. Keep in mind that many of the shops are closed on Sundays and Holidays. If you would like to eat at the Lighthouse (I’ve heard its a great spot) make sure you get reservations ahead of time. And most of all, have fun and enjoy the weather! Hi just got back from Bermuda 2 weeks ago. My first trip there. We spent a day at Snorkel Beach, which wasn’t the nicest beach. Our tour took us to John Smith Bay Beach, which was beautiful and had the pink sand. Bermuda is beautiful and it feels so close but so far since it’s only a 2 hour flight or a 2 day cruise (which is how I traveled). John Smith Bay was fantastic. We unfortunately lost all our pictures from our time there due to a fatal memory card failure! I didn’t realize that there were so many beaches to Bermuda. Not to mention so many things to do and see. Looks like a terrific warm place to visit that’s not too far away. So many beautiful beaches! Bermuda looks like a perfect summer getaway for the whole family.